I received an advanced uncorrected paperback proof copy of WorkParty: How to Create & Cultivate the Career of Your Dreams by Jaclyn Johnson through the Goodreads Giveaway program. Below is my honest, unbiased review of WorkParty: How to Create & Cultivate the Career of Your Dreams by Jaclyn Johnson. WorkParty: How to Create & Cultivate the Career of Your Dreams by Jaclyn Johnson is geared towards millennial women who want to start their own business. This book is part memoir and part entrepreneurial guide for woman who want to be their own boss. I love Jaclyn Johnson's no nonsense writing style. She writes a straight forward business book using lingo millennial women will understand and gravitate towards. There's no stuffy, dated, boring, information in this book. It's chalk full of savvy and much needed information from someone who has been there and done that. There isn't anything cutesy about WorkParty: How to Create & Cultivate the Career of Your Dreams by Jaclyn Johnson - except for it's cover!! 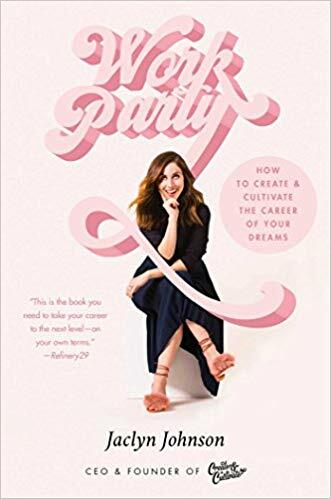 So, if you're looking for somewhere to start on your journey to becoming an entrepreneur, then start by reading WorkParty: How to Create & Cultivate the Career of Your Dreams by Jaclyn Johnson. WorkParty: How to Create & Cultivate the Career of Your Dreams by Jaclyn Johnson will be released in August 2018. Jaclyn Johnson—the founder and CEO behind Create & Cultivate, the fastest growing online platform and conference for millennial women in business— offers a rallying cry for a new generation of women who are redefining the meaning of work on their own terms: WorkParty. Women who want it all and more, and guess what? They can have it. I am giving WorkParty: How to Create & Cultivate the Career of Your Dreams by Jaclyn Johnson a rating of 4 stars out of 5 stars. Since I am for sure not a millennial I will have to recommend this one to women who are! It sounds like you got a lot out of it. I'm by no means a millennial woman either (Generation X here!! ), but I love books geared towards promoting women in business. Anything that promotes women in a healthy way is important to me. Thanks for stopping by and leaving me a comment! Happy reading! !